Intelligence & Terrorism Information Center: Hamas complains of cement shortage in Gaza, but uses whatever cement there is for military purposes. The Intelligence and Terrorism Information Center (Malam) reports that while Hamas complains loudly of a lack of cement in Gaza, because Israel prevents its entry, Hamas uses whatever cement there is for military purposes. Israel bans the entry of cement into Gaza because it can be used for manufacturing weapons and military installations, which are used against Israelis. He made the remarks at a gathering of Arab parties in Damascus, according to the Palestine Al’An of Nov. 12, 2009. Hamas smuggles cement into Gaza from Egypt and also manufactures its own. However, the supply is still not enough, and Hamas therefore continues to wage international campaigns to force Israel to allow cement to enter Gaza – and to raise charity funds for cement claiming its use for residential building. 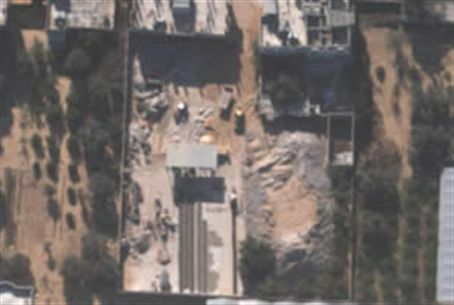 Malam reports, based on “reliable intelligence information of the past few months, including aerial photos,” there has been a notable increase in the use of cement and concrete by the Hamas military wing in Gaza. It is being used to build tunnels, fortify military compounds, and build new fortified buildings – many of them within civilian population centers. “This, as part of the Hamas strategy of using civilians as a ‘human shield,’” the report states. Hamas is also using cement to build launching pads for Kassam rockets and mortar shells. Positions of this type are being dug in ways that will enable the projectiles to be fired with only the “push of a button,” without the need for human on-site intervention.